Marketing to new business contacts in the Canadian province of Saskatchewan is easier when you leverage our human-verified SK email database. Download our localized Regina and Saskatoon mailing list to introduce your product or service to businesses in the area. The Canadian province of Saskatchewan (SK) is filled with rapidly growing businesses. To get an accurate business mailing list and begin talking to executives in this area, invest in a Saskatchewan mailing list from Bookyourdata.com. When you buy email leads from us, you get the human-verified localized, Saskatchewan email list your sales team needs to approach potential leads. That first impression you make on a new business contact is critically important. With our verified Regina mailing list, you will get the chance to make a good first impression. 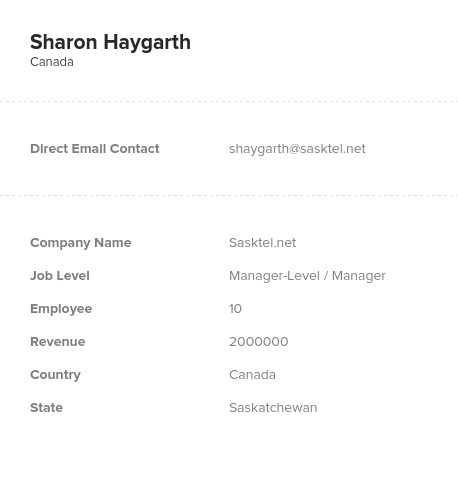 You can buy a human-verified Saskatchewan email database that has all of the contact information you need to make accurate and precise contacts. We help you to get the most from your marketing budget with a reliable SK mailing list. You can rely on our pre-built Saskatchewan email list to get you the direct contact information you need to enhance your own B2B email marketing list. We can help you to put new sales leads into your CRM platform simply by integrating the information from this targeted email database of businesses in Saskatchewan, Canada. Download our contact database today and experience the difference a Saskatchewan mailing list with direct, human-verified contact information can make.